University of Chicago Press, 9780226622729, 256pp. Dinosaurs have held sway over our imaginations since the discovery of their bones first shocked the world in the nineteenth century. From the monstrous beasts stalking Jurassic Park to the curiosities of the natural history museum, dinosaurs are creatures that unite young and old in awestruck wonder. Digging ever deeper into dinosaurs’ ancient past, science continues to unearth new knowledge about them and the world they inhabited, a fantastic time when the footprints of these behemoths marked the Earth that we humans now walk. Who better to guide us through this ancient world than paleontologist Mark A. Norell? A world-renowned expert in paleontology, with a knowledge of dinosaurs as deep as the buried fossils they left behind, Norell is in charge of what is perhaps America’s most popular collection of dinosaur bones and fossils, the beloved displays at the American Museum of Natural History in New York. In The World of Dinosaurs, he leads readers through a richly illustrated collection detailing the evolution of these ancient creatures. From the horns of the Protoceratops to the wings of the Archaeopteryx, readers are invited to explore profiles of dinosaurs along with hundreds of color photographs, sketches, maps, and other materials—all rooted in the latest scientific discoveries—sure to both capture the imagination and satisfy a prehistoric curiosity. The World of Dinosaurs presents an astonishing collection of knowledge in an immersive visual journey that will fascinate any fan of Earth’s ancient inhabitants. Mark A. Norell is Division Chair and Macaulay Curator, Curator-in-Charge of Fossil Amphibians, Reptiles, and Birds, Division of Paleontology at the American Museum of Natural History in New York. One of the most respected living paleontologists, Norell is a professor at Richard Gilder Graduate School, has held faculty appointments in the Department of Biology at Yale University, and has taught at Columbia University and the City University of New York. "A publishing season wouldn’t be complete without an oversize full-color dinosaur book, and if such a book isn’t produced under the auspices of the great American Museum of Natural History, it will naturally wish it were. Such a book must be as up-to-date as the breakneck pace of paleontological developments allows; it must be as visually stunning as its subjects; and, if possible, it must be written by somebody with a CV as long as your arm. New from the University of Chicago Press is just such a book: The World of Dinosaurs by Mark Norell, the chairman of paleontology at the American Museum of Natural History (the only true must-see destination for Manhattan tourists) and one of the specialists who oversees what is surely the most impressive collection of dinosaur bones and remains and artifacts in the world. 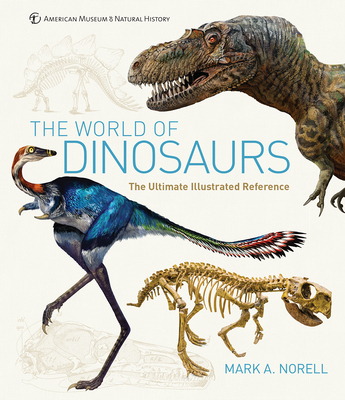 In this book—extensively illustrated with photos and drawings—Norell takes readers through the whole sprawling story of dinosaurs, organized not by geologic era but by overarching phylogenetic groupings, everything from various ceratopsians to the famous Tyrannosaurus rex and hundreds of their lesser-known kin. This author is well-practiced at conveying vast amounts of complex scientific information in a smooth and accessible narration, and as a result The World of Dinosaurs is every bit as much a delight to read as it is to page through."